A slice of pizza past. There is an oft mentioned theory amongst the pizza-enthusiast community that says the first time a child differentiates pizza as something better than mere food, that slice at that pizzeria will become their definition of "pizza" itself. Sam Sifton's Pizza Cognition Theory further stipulates that all future slices will be compared to - and inevitably fall short - of that one slice they had way back when. Paulie Gee (Giannone) may add support to this theory. 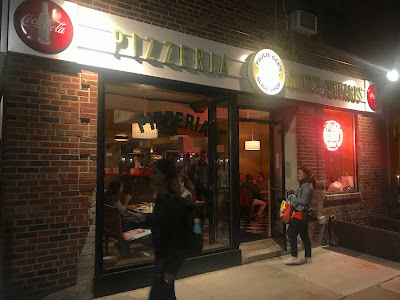 Already the owner of one of the most popular new pizzerias in the city, Paulie opened up a newer slice shop that is decidedly "old." The retro-vibe harkens back to yesteryear when similar pizzerias dotted the streets of every borough. Most of the classic New York City pizza parlors with the letter-board menus and bright colored Formica booths are gone. Instead of waxing nostalgic, Paulie Gee did something about it. Thanks to him, Greenpoint, Brooklyn is now home to a brand new old slice joint complete with a large selection of everybody's favorite extra large New York street slices - all Paulie approved (meaning they taste delicious). There are also plenty of napkins, paper plates, liners and serving trays to absorb the characteristically abundant orange oil. 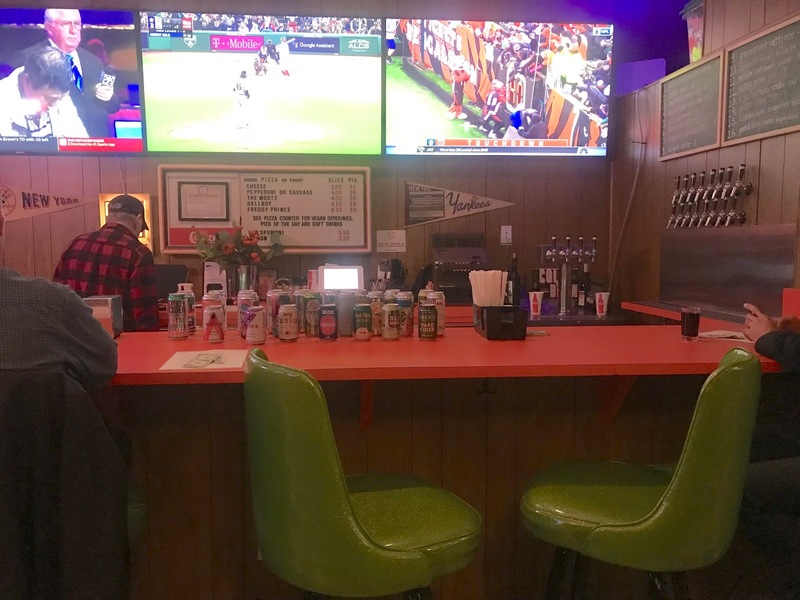 Paulie Gee's Slice Shop combines the best of the past with a nod to the present by offering vegan options, gender neutral bathrooms, beer, wine and posted times on when the pies exited the oven. Best of all, Paulie's menu includes some of his own original recipes with high quality secret sourced ingredients. With time and Paulie's undying love for the craft of pizza making, I am confident Paulie Gee's Slice Shop will be churning out slices of the highest caliber in all shapes and sizes very soon. If you're in Greenpoint, stop by and see what I mean. I'll be in the back playing Space Invaders on the Atari 2600. 1. Paulie Gee stopped by our table and we spoke about....P I Z Z A ! ! ! 2. Alyssa See is the manager of our Williamsburg Fall Softball League team Down to Field. We lost today on the field but won at the bbq and the pizzeria.